Did you know that the average American child now receives two dozen vaccines by their second birthday? In recent years, reports of children either dying, suffering permanent side effects, or temporary adverse side effects such as convulsions as a result of vaccines have surfaced with increased frequency, but the dangers of vaccines extend to adults as well. It’s time we stop blindly following the Center for Disease Control (CDC’s) vaccination schedule and start questioning the ingredients, safety and efficiency of vaccines. A look at a list of common ingredients in vaccines is astonishing. If you have ever received a vaccine, you’ve likely been shot up with aluminum, formaldehyde, antibiotics, MSG, thimerisol (a mercury-based preservative), and genetically modified organisms like egg protein, bovine (pig) extract and calf serum. If you don’t want these ingredients in your food and water, why on earth would you elect to voluntarily inject yourself and your loved ones with them? As with all pharmaceutical drugs, all vaccines are acidifying to the body. This means that they disrupt our natural pH balance and make our bodies steal alkaline minerals from our bones, teeth and muscles in order to self-correct. When we are over-acidic (as the majority of Americans are due to a poor diet and lifestyle), we are more prone to disease. At this time no “clean” vaccines free of these types of ingredients currently exists. Each injection is a chemical cocktail that can cause temporary or permanent side effects, diseases and disorders like headaches, brain damage, paralysis, cancer, and the very disease you are trying to vaccinate against. For example, studies have shown that children who have been vaccinated against whooping cough are actually more likely to get whooping cough than those who have not been vaccinated. American schools currently “require” this vaccine for all children entering 7th grade, but parents can and should sign a waiver to opt-out. Our bodies are naturally designed to heal and repair themselves. When you skin your knee, no action is needed, it will scab and heal over a matter of days. The idea of injecting toxic chemicals and artificial ingredients into our bodies to protect them from external diseases is ludacris. Just like with other pharmaceutical drugs, the goal of pushing vaccines is financially-driven, not health-focused. Our government is using the guise of public health and safety to require these injections among our citizens, but has offered no proof as to the safety or effectiveness of the vaccines. Conventional doctors have been brainwashed. Just as our school teachers have to follow strict curriculum guidelines, our doctors now have to encourage the CDC’s vaccination schedule as though it were gospel. According to Natural News, an investigative report by Dr. Lucija Tomljenovic, Ph.D., uncovered more than 30 years of hidden government documents exposing vaccines as fraud. While she focused mainly on the British health system’s elaborate cover-up of its own national vaccination program, the study’s findings still apply to vaccines and vaccination schedules in general. In reality, the odds of you contracting polio, measles, mumps, chicken pox and other diseases that vaccines commonly “prevent” is very low, and not because of the rate of vaccinated persons. Even with something as common as the flu, you only have a 20% chance of getting it in the first place, and thusfar the flu vaccine has only proven to be effective in 1.5% of cases! Rather than continuing to be vaccinated every time flu season rolls around or your doctor alerts you that a vaccine is “needed”, there are many ways you can boost your immune system and safeguard your health naturally. All disease is caused by toxicity and deficiency, which is why creating a mineral-rich alkaline internal environment in the body is the key to health. The easiest way to do this is to switch to ionized alkaline drinking water, and to drink half your body weight in ounces of this water daily. Ionized alkaline water is full of bioavailable minerals and antioxidants that nourish the body while simultaneously flushing toxins from the body. It can be made with an electric water ionizer for pennies on the gallon, and is believed by many to be the best drinking water on the planet. Eating a plant-based diet rich in alkaline fruits, vegetables, nuts and seeds is another way to alkalize the body, and taking vitamin D supplements and drinking herbal tea have also been found to bolster the immune system naturally. Stress, lack of sleep, lack of exercise or vigorous exercise routines are all examples of acidifying lifestyle choices that can be reversed for acid-alkaline balance. Another way to reduce toxins in the body is to limit exposure of acidic substances like drugs, alcohol, chemical cleaners and commercial beauty products. Ionized acidic water, which is also produced by an electric water ionizer, can replace many household cleaners and skin, beauty and hair care products. By nourishing your body from the inside out and reducing your toxic load, you can render dangerous vaccines completely unnecessary. This is part 5 in a 5-part series titled America: Home of the Drugged & Deceived? It’s no secret that pharmaceutical drugs carry many dangerous side effects, especially now that drug companies are required to list them in their advertising. In fact the side effects are often more severe than the ailment the drug is intended to treat. And when patients are forced to take multiple medications to treat multiple side effects, expensive and dangerous chemical cocktails can result. Unfortunately, most people take whatever drugs their doctors prescribe them with little questioning, and doctors are inundated and even bribed to push new drugs all of the time, which is why they have been called “legal drug dealers.” In fact, many medical schools are now sponsored by pharmaceutical drug companies, and feature a mere two hours of nutritional training total. Many people do not realize that their prescription drugs actually deplete minerals in the body. This is because all prescription drugs have an acidifying effect which your body corrects by pulling alkaline minerals to neutralize the acids. Pharmaceutical drugs are loaded with chemicals and artificial and toxic ingredients, but considered “safe” in small doses. However, we all know that an overdose can result in death, and that many of them are habit-forming and highly addictive. If you are taking a prescription or illegal drug, especially over a long period of time, that drug is bound to build up in your system, creating an acidic environment that is prone to disease. Our bodies are designed to thrive with an alkaline internal environment, and the two causes of disease are toxicity and deficiency. So by taking toxic drugs which deplete the body of its natural alkaline minerals, we are setting ourselves up for disease and other ailments, perhaps even the every issues we are attempting to treat with the drug. The FDA states that only a DRUG can “treat, prevent, or cure” a disease, despite the fact that homeopathic remedies have existed eons longer than anything the drug companies cooked up in a lab. This illustrates that the pharmaceutical industry has a hold on our government as well. They either have, are currently developing, or plan to develop a “pill for every ill.” Clearly, it is all financially-driven. Ever notice how the majority of prescriptions don’t actually cure the disease? They are designed to cover up the problem, and only work if you continue taking (and thus paying for) the drug. Conventional doctors don’t recommend natural remedies because the pharmaceutical industry can’t patent or make money off of them, not because they don’t work. Homeopathic remedies are almost always cheaper, safer, and better for your body than pharmaceutical drugs. You don’t need to be a hippy tree hugger to adopt them, and to turn away from prescription drugs. The next time you have an ailment, try a quick internet search for a homeopathic solution. You will likely come away with several solutions that may work. For example, many people don’t realize that dehydration is an underlying cause of many aches and pains, including headaches and backaches. The next time you have a headache, try reaching for a glass of water–preferably ionized alkaline water–instead of an acidifying pain killer. By addressing the root of the problem instead of consuming drugs which merely cover up the problem, you are arming your body with what it needs to heal itself naturally. This is part 4 in a 5-part series titled America: Home of the Drugged & Deceived? We assume that the food stocked on supermarket shelves is safe, regulated and thoroughly tested. But the truth is that the profit-driven food industry currently heavily influences the FDA and USDA, and does not have the consumers best interest at heart. This means that the real responsibility of making sure that what you and your family eats is safe falls to you, the consumer. The saying “you are what you eat” is more true than you may think. In fact, several links between food and disease have been found including 7,000 clinical studies addressing the link between diet and cancer alone. It’s no coincidence that the staggering rates of disease in America appeared alongside the growth of the processed food industry. Dr. Robert O. Young has long been studying the affect of various foods on our blood. He has concluded that most Americans are overly acidic, and that acidic foods create an environment in the body which welcomes all types of disease, whereas alkaline foods create a disease-resistant body. Acidic foods include meat, dairy, sugars, and processed/junk foods while alkaline foods include vegetables, non-sweet fruits, nuts and seeds. The majority of the foods found in today’s supermarkets would be unrecognizable to our ancestors. Potato chips? Fruit snacks? Soda? They were all designed in a lab and are filled with chemicals and artificial ingredients. And forget fast food restaurants. Studies show that a McDonalds hamburger left sitting out for over a year will not mold or rot because it is so unnatural, and French fries are considered carcinogenic and now require a warning sign. Even the salads sold at fast food chains usually consist of non-organic produce, processed meats and preservative-packed salad dressings. In addition to nitrates, GMOs (Genetically Modified Organisms) are a huge cause for concern. GMOs are predominantly found in corn, soy, and sugar beet products and are the result of a laboratory process where genes from the DNA of one species are extracted and artificially forced into the genes of an unrelated plant or animal. GMOs were first introduced into the food supply in the mid-1990s and are now present in the vast majority of processed foods in the U.S. but have been banned in most other countries. Several animal studies indicate serious health risks associated with GM food including infertility, immune problems, accelerated aging, faulty insulin regulation, and changes in major organs and the gastrointestinal system, according to The American Academy of Environmental Medicine (AAEM). Anytime you take a food from nature and process it, you are denaturing the food and thus stealing its essence and reducing its nutritional value. Take store-bought orange juice for example. Oranges are squeezed and their juices go through pulp reduction, deaeration and pasteurization which prepare them for storage in aseptic bulk tanks. These processes remove almost all of the flavor, and so manufacturers have to add artificial flavors in to make it taste and smell like the orange juice it once was. Most of us denature our food in our own kitchens through the use of microwaves, ovens, stoves and high-speed blenders and juicers. Microwaves should particularly be avoided because they decrease the nutritional value of the food most severely and present other health risks. Even some “health foods” are so heavily processed that they are actually unhealthy (think granola bars and power bars). A good rule of thumb is that if a food label lists more than five ingredients it should be avoided. There are many ways that you can begin to choose the right foods and lower your risk for disease in the process. Try to buy fresh, organic, local food whenever possible or grow your own food. Aim to eat a diet of 80% alkaline and 20% acidic foods. Read labels. 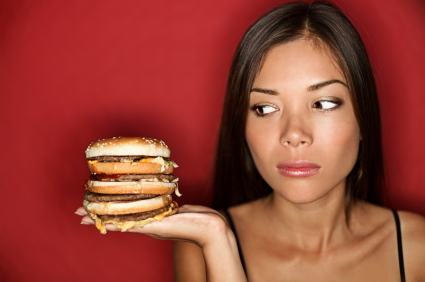 Avoid fast food, processed foods and junk foods. Eat raw food whenever possible and avoid using the microwave. Soak all produce in 8.5 pH Chanson ionized alkaline water for 10 minutes before consuming. This is part 3 in a 5-part series titled America: Home of the Drugged & Deceived? Did you know that one in two men and one in three women are now predicted to contract cancer during their lifetime? It’s a growing epidemic that interestingly enough did not begin to boom until after World War II when processed foods, additives, and pharmaceutical drugs became mainstream. We all know that after decades of research, chemotherapy, radiation, and invasive surgery are still the go-to treatments recommended by conventional doctors. Yet, chemotherapy is only effective in 2% of cases, and both chemo and radiation actually poison and weaken the body, contributing to the disease! Most of the time, even when doctors claim that they have removed all of the cancer cells via surgery, the cancer will appear in another area of the body, because surgery does not remove the root cause of the disease: over acidity in the body. So why do doctors continue to poison, maim, and kill their patients year after year, when the odds of curing them are so severely stacked against them? For every one person who has cancer, there are eight people making money off of them. A natural cure for cancer exists, and has been known for decades. But there’s no real profit in it, so the cancer industry–yes it is an industry, led by the American Cancer Society–has done everything in their power to conceal this information so that they can continue to benefit on the conventional cancer “treatment” methods. They have gone so far as to smear the allopaths as snake oil salesmen, prevent American doctors from recommending natural treatments, cause nothing but a drug to be legally allowed to claim to “treat, prevent or cure” a disease, tamper with studies to show false hope for conventional cancer treatments, and even assassinate people who have tried to expose the truth. But I’m here to tell you the truth, and to arm you with the information that can prevent you from losing yet another friend or family member to cancer. Cancer is not something that happens to you at random, nor is it truly inherited through genetics. Cancer is a lifestyle disease and a mutation of cells caused by toxicity and deficiency. We live in an over toxic world and are exposed to more toxins in one day than our ancestors were in a lifetime. Because of this our bodies are constantly struggling to stay in pH balance. In fact, if our blood becomes too acidic we die, and our bodies will actually rob alkaline minerals from our bones, muscles and teeth just to regulate our pH. The problem is that the Standard American Diet (SAD) is extremely acidic. When we aren’t consuming enough alkaline minerals to offset the acidity in our diet and lifestyles, we become both mineral deficient and over-toxic (over-acid). This sets us up for all forms of disease including cancer. Alkaline foods tend to be the natural plant-based foods that you inherently know are good for you, while processed, pre-packaged, fast foods and junk foods are acidifying to the body. Start introducing more organic fruits and veggies, nuts and seeds into your diet and try to crowd out the bad with the good. Daily juicing and green smoothies are a great way to increase the amount of fruit and vegetable servings you consume, however stay away from the really sweet fruits. Ideally you will want to be eating 80% alkaline foods and only 20% acidic foods. Dr. Keiichi Morishita M.D., author of The Hidden Truth of Cancer says, “Drinking water that has a high alkaline pH, because of its de-acidifying effect, will help in preventing cancer. In Asia, alkaline water is regularly served to patients, and is considered a regular part of treatment.” Proper hydration is extremely important in the body and a great way to flush out toxins. Aim to drink at least half your body weight in ounces of ionized alkaline water from an electric water ionizer daily. Living a green lifestyle is a great way to reduce the amount of toxins in your home. This includes switching your cleaning products and beauty and skin care products, most of which are loaded with toxic chemicals. Ionized acidic water from an electric water ionizer is an all-natural and antibacterial fluid that can replace many of these products including glass cleaner, floor cleaner, all-purpose spray, hand sanitizer, facial toner, mouthwash and much more. Tap water is loaded with cancer-causing chemicals like chlorine, chloramines and fluoride. Even if you aren’t drinking your tap water, a drinking water filter is necessary if you use tap water when cooking. Many of the chemicals in tap water are actually inhaled when you take a shower, flush the toilet, and use the dishwasher or washing machine, so a shower filter and/or whole house filter can also reduce the amount of toxins in your home. There are many detoxification methods that have been proven to be effective against cancer including infra red saunas, coffee enemas, hydrotherapy, colon cleanses, natural clay baths, and fasting, so implementing one or several of these methods can clean out your system and speed your recovery process. For more information on natural cancer remedies and the truth behind the cancer industry, we highly recommend the eye-opening films Healing Cancer from Inside Out and Cancer is Curable NOW. This is part 2 in a 5-part series titled America: Home of the Drugged & Deceived? Most Americans drink fluoridated water, brush with fluoridated toothpaste and give their children fluoride treatments when they take them to the dentist. This is because our government has been promoting fluoride as beneficial for dental health for decades. Unfortunately, it’s a blatant lie and a means of disposing of a toxic waste product with the appalling side effect of dumbing down and controlling Americans. I was a pediatric dental assistant for 9 1/2 years. The dentist I worked for graduated from USC and was the president of the Pediatric Dental Association. He lectured all of the parents of our patients on the importance of drinking fluoridated water, and I never once saw a parent disagree with him. We even had a chart that showed the fluoride levels of all of the surrounding cities, and would recommend bottled fluoridated water for those who lived in cities with low fluoride levels or who used reverse osmosis systems in their homes. When I switched jobs and the co-owner of Chanson Water told me that fluoride was something that should be filtered out of our water, I thought she was crazy. I trusted my former boss explicitly. After all, he was a very prestigious doctor, surely he knew what he was talking about and would not recommend something so harmful to children of all people? But after doing my own research I realized that she was right, and the dentist and I were the ones who had been duped. Fluoride-pushers often argue that fluoride is a naturally-occurring and safe heavy metal. But it turns out that the majority of the fluoride intentionally added to our municipal water supplies is actually a combination of hexafluorosilicic acid and sodium silicofluoride, often contaminated with heavy metals. Both are considered highly toxic by the EPA and considered a hazardous waste product, and there is no “safe” level of heavy metals for drinking water. In fact, fluoride is so toxic that if a 3-year old child were to consume a 7 ounce tube of fluoridated toothpaste he would die, which is why all fluoridated toothpastes are required to have a warning label instructing people to call the poison control center if swallowed. Because studies have shown a direct link between lowered IQ and drinking fluoridated water, conspiracy theorists believe that part of the reason our government intentionally poisons our water is to make us more docile as a means of control. We have been warned that terrorists might attack our water supply, yet we are already being poisoned by our own government! Fortunately, there are many easy ways to reduce your exposure to fluoride. Even if you are relying on bottled water for your drinking water, if you use unfiltered tap water to cook with, fluoride and other toxic chemicals may be making their way into your food. Unfortunately, the cheap pitcher and faucet filters sold in grocery and hardware stores do not address fluoride and actually contribute to the propaganda that fluoride is beneficial for dental health, so if you are currently using one of these you will need to upgrade. The most popular method for filtering fluoride out of your water is with a reverse osmosis system, however they take out the good alkaline minerals as well, which actually renders the water acidic on the pH scale. A better solution is a modified reverse osmosis system like the Chanson Nano or Nano2, or our C-3 triple filtration system. All remove fluoride and other harmful contaminants while keeping the healthy alkaline minerals in. View all Chanson pre-filters. You will be hard pressed to find a non-fluoridated toothpaste on a mass supermarket shelf. Check your health food store or order online and remember to read the label carefully because even some “natural” brands like Toms offer fluoridated versions. You can also make your own natural toothpaste on the cheap using a blend of baking soda, coconut oil and (optionally) peppermint or spearmint essential oil for taste. Ever seen those colorful bottles of fluoride rinses at the store with your child’s favorite cartoon characters splashed on the front? They even have grown-up versions now. Don’t buy them. And if you already have them, toss them out (just don’t dump them down the drain!). If your child(ren) are particularly upset about a change in their routine you can make an all natural mouthwash using a blend of ionized acidic water from a water ionizer and a blend of lemon, lime and orange essential oil. And the next time you or your children go to the dentist, tell the dental assistant that you want to opt-out of the fluoride treatment and request that they make a note on the chart not to offer it again. Because the majority of farmers are watering their crops with fluoridated water, fluoride makes its way into our food supply and is nearly impossible to avoid altogether. You can reduce your exposure by buying or growing your own organic produce. You should also minimizing your consumption of processed foods, because aside from being unhealthy, the more processed the food, the more chances it had to be made with fluoridated water. While the majority of U.S. cities are currently fluoridating the water, some have already opted-out, recently including Portland, OR. Write to your legislative officials and tell them that you do not want fluoride in your tap water, and vote or petition against this practice if the opportunity arises in your area.